The ShowerBaby® is an all-in-one baby cleaning station designed to be located in the home bathroom and can be quickly folded down for use. 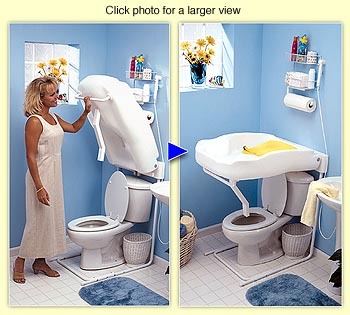 It is self-supporting (it does not mount on the wall), making it portable and easy to install. 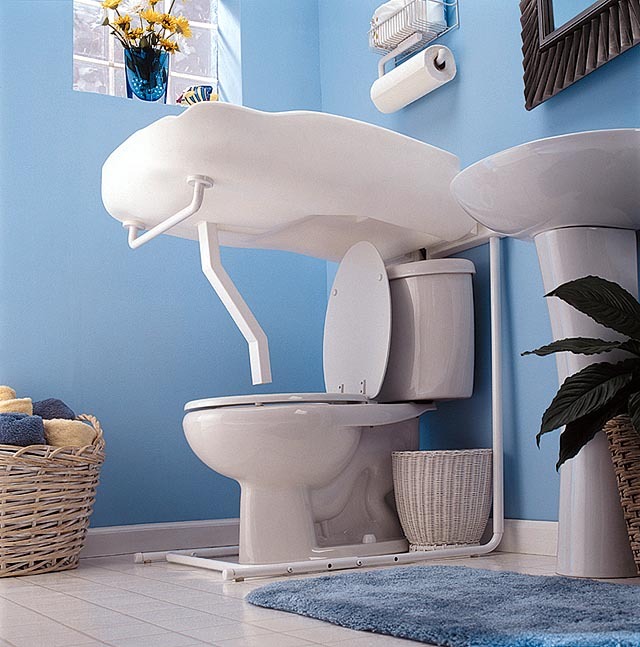 Will work with any standard size commode that has a tank no wider than 21inches, no taller than 30 inches, and no more than 6 feet from the sink. 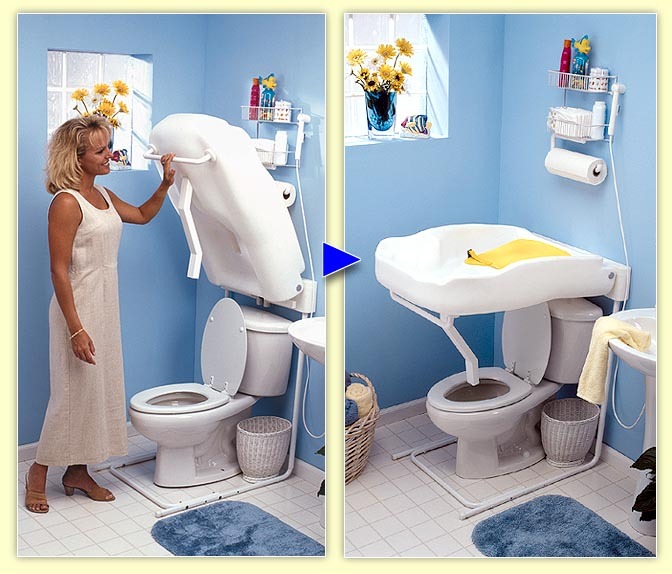 The dimensions of the ShowerBaby® unit are 10" x 24" x 37" and it weighs 21 lbs. When lowered for use the bath extends out from the wall 37" and works perfect in small bathrooms. 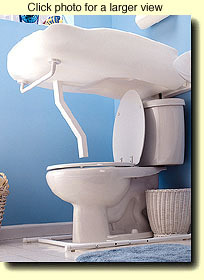 The waste water from the ShowerBaby® flows into the commode bowl through the built-in drain system. The drain tube automatically drops down as the unit is lowered for use. Give your baby a refreshing and gentle shower when changing diapers or giving baths with the Euro-styled shower wand. The shower wand has an on-off control button and comes with 10 feet of 1/4-inch diameter super-flexible hose. 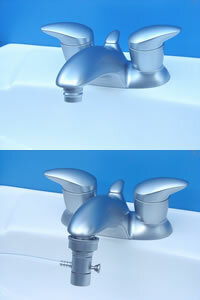 The shower wand easily attaches to most bathroom sink faucets with its specially designed faucet adapter. Easily connects to faucets by replacing existing aerator with the stylishly designed combination aerator / snap-on adapter (click pictures on the left to see details). The diverter valve also allows you to use the sink or hand shower with the simple pull of the button located on the side of the valve. Constructed of molded polyethylene the ShowerBaby® Stations are built to last. Child protection straps with snap-lock fasteners hold the child securely in place and offer parents added peace of mind. FDA approved high-impact polyethylene resists fungal and bacterial growth. Meets ASTM standards for anti-fungal protection. 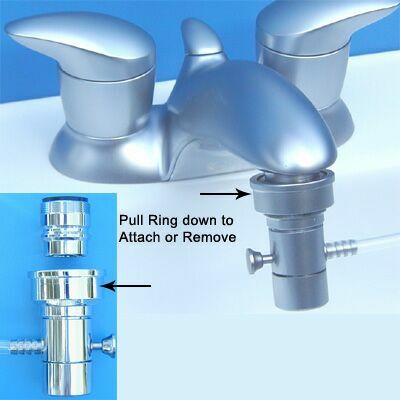 Snap-on faucet adapter & diverter valve w/aerator are made of solid brass and chrome plated for years of use.